The Town of Cape Charles encompasses a federally-maintained harbor for industrial, commercial and recreational vessels. As the federal channel exits the harbor, it parallels the southerly shoreline before diverging into the bay. There is a natural shoal on the west side of the channel at the harbor mouth. Unfortunately, the harbor is subject to any wave action created by winds with a westerly component. The town originally suggested a fixed timber wave screen situated inside the harbor to protect a small area. Langley & McDonald was retained by the town to investigate alternatives. In association with Dr. David Basco with Old Dominion University, we studied wave conditions and storm surge with the goal to protect the harbor during a category 3 hurricane. 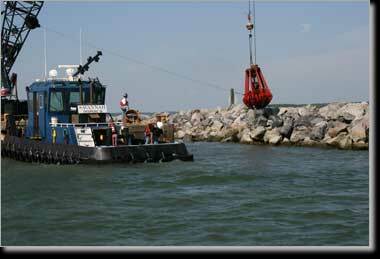 The selected alternative takes advantage of the natural shoal to locate a series of riprap breakwaters. 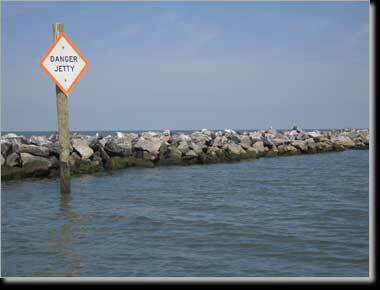 These breakwaters are designed with a top elevation of +7.0 (MLLW = 0) to reduce the transmitted wave energy to less than a 2' wave inside the harbor during a category 3 hurricane. 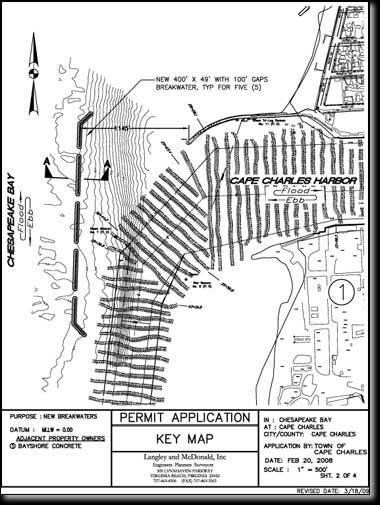 Permits were approved and 2 of 5 breakwaters are constructed.